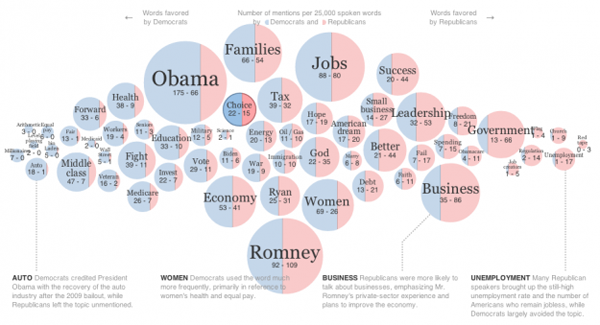 We’d like to share an interesting example of discourse visualization, created by the New York Times. It shows how often speakers at the two presidential nominating conventions used different words and phrases. The visualization is quite simple but effective. Each word is represented with a circle, and size represents its use. the circle is divided showing the word’s use by each group. X axis represents polarization (democrats on the left, republicans on the right). Visualization loads only the most used words, but it is possible to add other words or sentences just typing them in the form. This visualization not only allow to get an overview of the discourse, but also to reach the punctual data. Clicking on a words, it returns a list of all the sentences containing it. This link between an global and detail should be one of our goals: also from London’ workshop we saw that when people engage with a visualization, they want to go deeper in details. © 2012 EMAPS | Powered by WordPress | Theme 'Sirup' by 1000ff | 39 queries 0.236 sec.